Thy Hand Hath Provided: Seeds Giveaway! 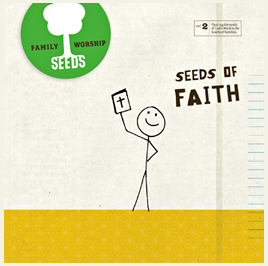 I month or two ago, Karen introduced me to Seeds Family Worship. It's a series of five (soon to be six) CDs of Bible verses put to music. Before you start thinking about those kid's Bible verse CDs that you might own that drive you a little bit nuts because the singing isn't that great- in fact it's downright shrill- let me just say that these CDs are something else. We have Volume 2, Seeds of Faith, and we all adore it. The music is so well written and sung by adults with excellent voices with sweet children's voices as the echos and back-up singers. To me, they sound like angels. And the lyrics? Well. They're perfect, of course, because they are the Word of God. If you want some proof, go have a listen here. What a wonderful way for our families to memorize scripture (which, as you know, gets harder the older we get). The other really cool thing about these CDs is that each one comes with a duplicate copy for you to share with a friend or another family. Help with witnessing? Who can't use that? So, today, because the earth is a screaming testimony to it's Creator and because in a couple short weeks we'll be celebrating God's ultimate gift- Jesus' crucifixion and resurrection, I want to give away a copy (which really means a 2 in 1 copy) of Volume 2, Seeds of Faith. To enter, please hop over to their website and read about their ministry, browse a bit and then come back here and tell me whatever you want to- I'm not feeling very choosy today. Oh, and one more thing! When the folks over at Seeds Family Worship heard about this giveaway, they offered to give you all a 20% discount off your Seeds Family Worship order if you enter THYHAND in the coupon code box. You know. If you can't wait to see if you've won:-). One entry per household, please. I'll draw a winner sometime this Thursdayafternoon. Please leave an initial or name if you're commenting anonymously so I can identify you if you win. Fine print: I will be purchasing the CD myself to give away. I wrote this review on my own accord and have not been given anything to do so. That ministry looks awesome! I love that there are interactive activities on the website for kids too. We just bought a new (used) minivan with a CD player, so I've been looking for things to listen to that are Mommy and babies friendly. This looks like a perfect solution! I love the family activities they list. It is something grandparents could do with their grandchildren too. I think they have a wonderful ministry! That looks great! Something my five year old will love! Thanks for the chance to win! My kids would love this. At first I thought you were giving away garden seeds but this is much better! Well, I went and listened to the samples, and when they were done my daughter exclaimed, "That was great! I want more!" So regardless of whether we win this CD, I guess I need to start setting aside some money to get all of them. This looks like a wonderful ministry and a wonderful chance for our family to listen and grow in the Lord. Thanks for the opportunity. I remember seeing these a while ago, but I had forgotten about them! Thanks for the reminder! What a great way to help them memorize Scripture. I misunderstood the post title. I was expecting a seed swap or something, but I like the music idea too. :) We can always use more uplifting music in our home. Wow! That's fantastic! Thanks for sharing this amazing ministry with us! I've shyed away from Scripture memory song cd's just for the reasons you listed, the "seeds" people have done a marvelous job! how refreshing. I like those memory cards. My kids are just about the right age to start. jlandeck at gmail dot com. This would be great to use with my two boys and my S.S. class! This would be awesome for both my Sunday school and for the little boy my parents recently adopted. He's almost 2. And he picks up stuff so fast! I would love to sing these songs with Abby and Sophie. I'm always on the lookout for uplifting, quality music. Great giveaway! I've been looking for something just like this for around the house & in the car! Thank you so much for sharing! renee here again - i just wanted you to know i shared this with some of my facebook friends and our children's director at church and several people i know are getting them now! thanks for passing on a great thing! :) You pass on ALL sorts of 'seeds' to grow don't you? ;) Peace, r.
This would be great to listen to with my son. Thanks. I only recently found your blog, and I've really enjoyed my visits. We're a family of 15, and I know my children would benefit from listening to these Scripture songs. Thanks for the opportunity:) Blessings! Thanks for sharing this great resource. We were given a CD/DVD combo of scripture songs for children and I don't get tired of it. I don't mind having scriptures running through my head. I will have to get a copy if I don't win one. I've been wanting to get some music for my little guy, but have held off for just the reasons you mentioned. I bookmarked their link to get some music next time we get a wee bit of money together for something special. Thanks for telling me about it. We have Seeds of Praise Vol. 3 and love it. You reminded me to get to their website and buy the others but I'll at least wait to see if I happen to win this time! A good friend recently played this CD for me and I loved it :) Great for children and parents! Thank you for another great giveaway!